The history of Los Olivos began with a stagecoach route in 1861, The Overland / Coast Line Stage established a station at Ballard, just south of present day Los Olivos. Running from San Francisco down to Ballard, and continuing south through Los Angeles before ending in San Diego, the stage provided important transportation back in the day. In 1885, twenty-two year-old Alden March Boyd, from Albany, New York, paid $8,000 for approximately 157 acres of prime farmland on a bluff overlooking the Alamo Pintado Creek. Boyd constructed a two-story house, planted 5,000 olive trees, and named his new property “Rancho de los Olivos.” Two years later, on November 16, 1887, the Pacific Coast Railway successfully completed their narrow-gauge extension line from Los Alamos into the new town, which the developers successively called “El Olivar,” then “El Olivos,” before eventually settled on “Los Olivos” after Boyd’s nearby ranch. In 1988 the Boyd ranch was sold, and the new family built a more modern home next to the century-old two-story. Recognizing the historical significance of the farmhouse, the home was moved in two pieces to a new site at the corner of Nojoqui and Alamo Pintado Avenues in Los Olivos. Across from St. Mark’s-in-the-Valley Episcopal Church, the elegant home with its wide, covered front porch, symmetrical arched windows in the center gable, and curiously low placed door knobs is well maintained and currently houses a variety of offices. A development boom came with the anticipated arrival of the Pacific Coast Railway to a new station in Los Olivos. Chinese workers were hired to level the streets, and the developers boasted the town would become the “center” of northern Santa Barbara County. A Map of the town, created by the Los Olivos Land Association in the 1880s, shows a large “Courthouse Block” with elaborate walkways, and the location of the proposed “Los Olivos Hotel” with its own grand street named “Hotel Ave” leading up to the site. The Railroad did open the “Hotel Los Olivos” at that location May 1, 1888, but it burned down January 1890, and never rebuilt. The old map is carefully delineated with parcels, which extend way beyond the current township, and it is entertaining to try and match the present day reality with the optimism of the past. Entrepreneur Felix Mattei had been watching the development of the Railway and was patiently waiting for the right moment. In 1885 he heard the news about the incorporation of the “Santa Ynez Land & Improvement Company” and its purchase of a large acreage in the area of Boyd’s ranch. Mattie hurried to San Luis Obispo to study the plat of lands. Locating the turntable and roundhouse that was to be built a block east of Grand Avenue, he recognized that this signified the southern terminus for the railway, and bought his land right next to the station in order to cater to rail and stage passengers making the north and south connections. Mattei’s “Central Hotel” was completed in 1886, but after the Railroad’s “Los Olivos Hotel” burned, he changed the name to “Hotel Los Olivos,” however the colloquial label “MatteisTavern” quickly became the recognized name of the establishment. During this time period Los Olivos started to boom. A small Christian Church was erected at Santa Barbara and Alamo Pintado Avenue, which still remains to this day. False-fronted stores, a U.S. post office, public school, livery stable, and a blacksmith shop, along with a drugstore, and more graced Grand Avenue. A few of the buildings are still standing, and it is interesting to take a self-guided walk with the “Los Olivos Historical Walk Tour” map to check them out. Part of the Los Olivos Wine Merchant & Café, was formerly owned by a local Butcher, Bent Clausen, who operated “Clausen’s Old Fashion Deli” on the site, prior to being “Allmendinger’s Deli” before Sam bought the property. The identity of Los Olivos is so authentic that the iconic town has been used as the location setting for some of the scenes in the made-for-tv movie “Return to Mayberry” – based on the 1960’s “The Andy Griffith Show,” the infamous double date scene with Wine Wall backdrop at the Los Olivos Wine Merchant & Café in the 2004 movie “Sideways,” and numerous commercials shot within the area. This past year, Los Olivos District officially became the latest AVA designated in the Santa Ynez Valley. Named after Alden Boyd’s Rancho de los Olivos, it encompasses the townships of Solvang, Los Olivos, Ballard and Santa Ynez. This district has the largest concentration of vineyards and wineries, and is the oldest in the Santa Barbara County – going back to when the Spanish Franciscans founded Mission Santa Ines in 1804 and planted grapevines, which produced small quantities of wine. The Los Olivos Wine Merchant and Café are proud to have relationships with many of these boutique wineries, offering their unique vintages for tasting and sale. Be sure to stop in and speak with their knowledgeable Wine Merchants to discover these local jewels. 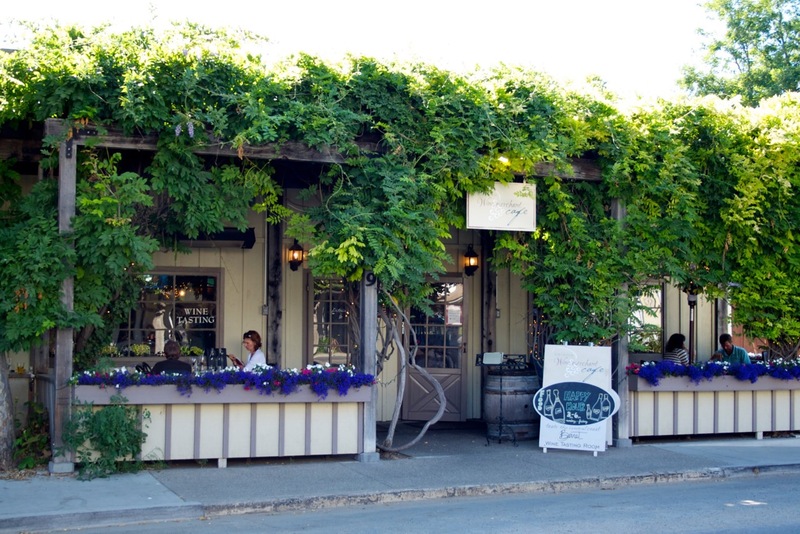 Currently, Los Olivos is home to unique, locally owned boutique shops, art, fine dining, and wine tasting rooms. The intimate nature of the town makes it easily accessible to explore on foot. The Cotiere Pinot Noir, Santa Maria Valley, is one of those wines that stops you in your tracks, once you try it you have to find out what it is, who made it, and how to get more! It is a head turner, the flavors are rich and textured throughout, with plenty of resonance and fabulous overall balance. After about 10 years of harvest work, and assistant winemaking, Kevin Law began his own label, Cotiere, in 2006. A geology major who found himself getting involved with atmospheric sciences, meteorology, and mapping, Kevin decided to expand his experience into something he was genuinely passionate about; wine. Like all great winemakers, there are individuals who influence and guide them along their journey, Barbara and Jim Richards of Paloma on Spring Mountain in Napa, were incredibly helpful to Kevin. Cotiere wines are made humbly out of respect for the fruit, to reflect that year’s unique growing conditions. The wines are crafted to offer a sense of place, an expression of the Central Coast terroir. Kevin wants to stay true to the grapes individuality per row, block, vineyard, and year. The fruit for Cotiere wines is sourced from selected vineyards such as River Bench, Thompson, Hilliard Bruce, La Encantada, and Presqu’ile. Keeping each vineyard separate he shows the honest truth of terroir, creating a unique experience for wine drinkers. We’ve had the honor of meeting Kevin, tasting his wines, and getting to know him on a personal level. We can vouch that Cotiere wines express the true authenticity of their place because of the character of the person behind them. Can’t think of a better way to experience the terroir of the our Santa Barbara Wine Country then enjoying these wines. Kevin’s Pinot is one of many fantastic wines he produces for his Cotiere label.